Running is the simplest sport. You don’t need a ball, a court or a partner. In fact, you don’t even really need special sneakers because barefoot running is a thing and races have been won in socks, combat boots or whatever footwear a person happens to have on at the time. But running can also be complicated and if you don’t do it right, you can hurt yourself. The number one reason runners pull out of races are injuries – a lot of injuries that can be prevented if proper running form is maintained. As a repeat runner, you need to know how to run with your body erect, how to maintain control of your limbs so you’re not throwing yourself onto the pavement like a sack of flour with each step. Running properly helps you run better, it lessens the impact on your knees, and it’s fun. Check out this info graphic I got from Pinterest. A couple years ago ESPN did a short feature on 2014 Boston marathon winner Meb Keflizighi’s running form and it’s still one of the impressive running documentaries I’d ever seen. Meb picks up his stride so quickly that he spends 75% of his time (three-quarters of the run) completely airborne instead of in contact with the ground. And you don’t get hurt in the air – you get hurt when you’re on the ground. If you want to know how to run properly, check out Meb’s form. Textbook, they call it. Caution: do not watch this clip while you’re at work because it will make you want to go outside for a run immediately. Thanks for this post girl! 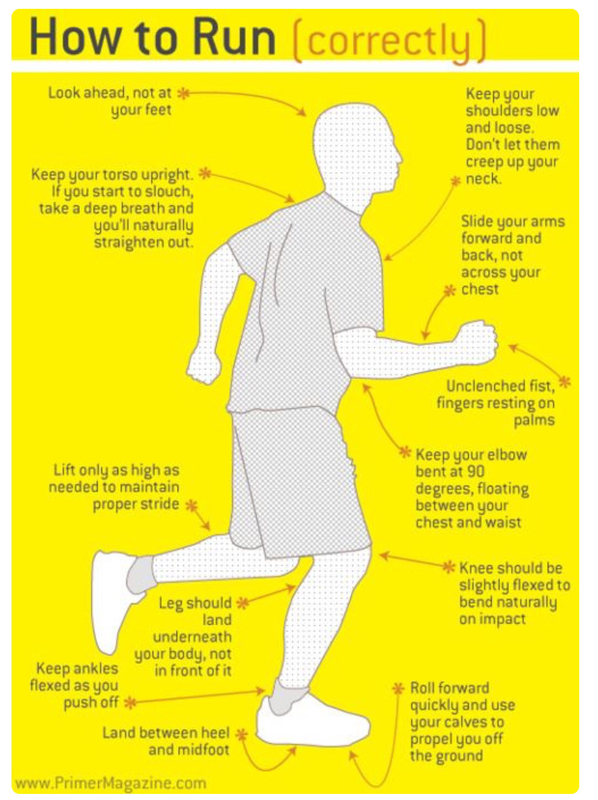 Im new to running still and love all the little tips to help me to get it right and done strong the first time as I do more running. Plus I dont want to be hitting down like that sack of flour you mentioned lol. I love the infographic and am definitely sharing this blog post with my running accountability group! Happy blogging! Great post on Running, I totally agree don’t watch Meb run unless you’re prepared to go run! Running can be so simple yet we make it difficult! Thanks for posting this! I enjoy running but could certainly work on my form, as I frequently suffer from shin splints and knee pain when running! This is super helpful. The first step is in admitting that you need help. I am at the same place. I took running pics yesterday and realized I need to pay attention to my form if i am going to get better with my running so you’re not alone. All the best to us as we both try to improve. This is a fantastic post! I just realized i am guilty of a few form issues. I have some hip problems and I think they could be a result of not taking proper care! Thank you!!! You’re welcome! It’s a common problem. Maybe even more common than we know. A running-blogger I read regularly goes to a doctor on a regular basis for problems related to running form. I hope your hip issues get resolved easily. Great post idea! My dad and I always talk about how the reason so many runners get injured now days, vs 10-20 years ago are all these weird train less plans that are ever popular with runners who don’t want to put as much time into it now and are looking for an easier fix. You nailed it right on when you said most injuries can be prevented when proper running in maintained. Proper running form and proper training, makes a world of difference between the majority of those who get injured running vs. the ones that can stay injury free or less injured! You’re right about the sports bra. It’s the number one piece of gear for women. I don’t think that’s just me. Just lol at how much they cost sometimes. A good one could cost almost as much as running shoes. We’ll get you back on a run someday. Until then, enjoy those walks, Patrice! Do you track your walking mileage or your daily steps? You should check Amazon for the charger. My friend bought a Fitbit charger on there a few months ago. I just bought 2 for $2.47. Awesome sauce! Great info graphic Karen. I love quick, visual, usable information. It’s something you can always picture in your head as you run. Lately, I have really been concentrating on my feet landing under my body and not way out front. Also a lot of concentration on breathing. Nice to meet you through this Blog Hop and I look forward to your spotlight day!! Thanks so much for visiting. I look forward to keeping in touch with you via your blog. Looking at my running pics, I realize I don’t land with my feet under my body either. It’s no wonder sometimes when I come back from a run, I’m aching all over. Thank you for this Karen. The infographic is excellent and great for reference. The very 1st thing I noticed is my fists. I consciously have to keep unclenching them while running, but I know there are a lot of other areas that need tuning up on. You’re welcome, Carl. I think even when we’ve been running for a long time, most of us fall into habits so it’s good to get a refresher once in a while. Great infographic! I have trouble maintaining proper form on longer runs. I get tired and don’t focus on my form as much as I should when I’ve been running 2+ hours. Meb is amazing! Thanks for reading, Debra. I know it’s easy to focus on form at the beginning of a run, when you’re on flat ground. But as the run gets longer and you navigate the hills, it’s harder to maintain the form. Just do your best to stay injury free so you can keep enjoying your runs.